You can’t think about search without thinking about social media, and vice versa. They complement each other, and both initiatives come out stronger when they’re approached holistically. 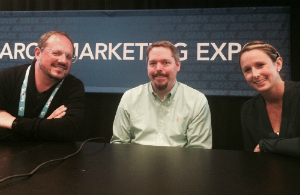 In SMX East’s “Better Together: Search + Social,” Casie Gillette, Eric Werner and Geoff Colon share their tips straight from the search and social trenches. Social monitoring tools: Hootsuite, TweetDeck, Sprout Social, Mention, Moz, Keyhole. You have to have content that people want to share in social media. Use Buzzsumo to see what’s already working. Put in a keyword phrase and you’ll see the top shared content. Put in a site and you’ll see the top shared content. Find out who’s sharing content and how. The 2015 B2B Web Usability Report is a piece of content KoMarketing created. They reached out to Marketing Land, thinking that would be the best channel for their target audience. They reached out to influencers they’d interacted with, as well as all 300 of the survey participants. They also did paid social promotion. They wrote a blog post, sent it out. The results? It was a top linked page on site. “It’s not easy to get such great results – you have to plan things like this out,” Gillette says. Werner began looking closely at the Home Depot’s relationships with influencers. He had to admit that what Home Depot was offering influencers, while it was working, was just okay. “We decided we had to offer something better. We started thinking about creating a special meal for each individual influencer,” says Werner. One way Werner found to more effectively interact with influencers? Stronger hooks resulted in better relationships with significant influencers. Strong hooks are: credible, useful, exclusive or interesting. Give someone a reason to do something and they’ll be more likely to do it. Don’t talk about platforms or technology. They come and go. What’s big now might not even exist tomorrow. Talk about how people behave. What do they do? What do they like? 2015 demands buying convenience, omnichannel solutions and 24/7 convenience. Do you get upset if it’s 2 a.m. and you can’t get an Uber? We want things on demand, here and now. Mobile changes how we behave. Does social drive awareness and search drive intent? No. Many think this is the case and align their advertising so that social data fuels search intent. The web and behavior aren’t linear, so to think people see content on social and then search for it is too simplistic with the complexity of human beings. People are in discovery mode on social, not intent mode, so they are more inclined to dig for information later if they’ve discovered it on their own time. Are Google and Bing the last stop on a customer purchase journey? No. They weave in and through the web and physical places, asking lots of questions. Bottom line: Find the source of demand and go there as a starting point, wherever it is: search or social.